@haydenjr: OK that’s it! I tried to just turn around and walk away just to silence my accusers. But this is too much already. 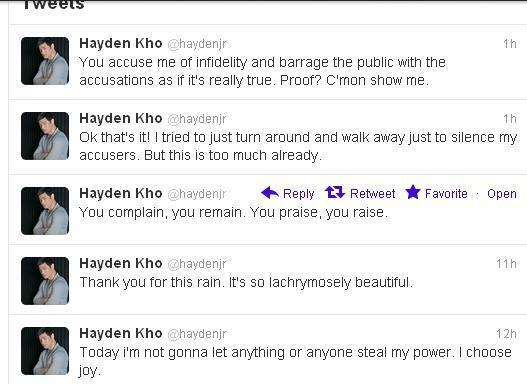 @haydenjr: You accuse me of infidelity and barrage the public with the accusations as if it’s really true. Proof? C’mon. Show me. Hayden Kho to Vicki Belo: "You accuse me of infidelity and barrage the public with the accusations as if it’s really true"
Kho appeared to imply that Belo, to whom he got engaged last December 2010, has cheated on him with bikram yoga instructor Aljarreau “Al” Galang. He was the second runner-up in Mossimo Bikini Summit 2007. He uploaded the image of a letter to support his claim that the two are having an improper relationship (Khow has already deleted the post). The latest chapter in the Kho-Belo saga began when the popular cosmetic surgeon wrote on Twitter last February 10: “nancycastilogne you can now openly date @haydenjr . You have my blessings. Hope you’ll both be happy.” Kho immediately responded: “Before things go out of hand: Vicki and I are just having a misunderstanding. Don’t make conclusions. ” He erroneously added that “There’s infidelity issue here.” He corrected his post moments after. Now, that seems to be a Freudian slip on his part. Two hours later, Kho made another batch of Twitter posts to “fix” the controversy created by his earlier updates. “In the height of my anger, I tweeted those things and now I regret it,” he wrote. He emphasized that though the letter he uploaded before is real, Belo was able to explain her side to him and that he “believed” her. “Vicki DID NOT have an affair with that guy (Galang),” Kho wrote. He also declared that Belo never cheated on him. This entry was posted on Tuesday, February 21st, 2012 at 2:57 am	and tagged with entertainment, hayden kho, hayden kho - nancy castiglione affair, hayden kho - vicki belo split, hayden kho - vicki belo twitter, nancy castiglione, vicki belo - al galang, vicki belo hayden kho break up and posted in hodgepodge, social networking sites. You can follow any responses to this entry through the RSS 2.0 feed. whatever.. kho deserves happiness.. he is single and great bachelor.. vicki has a kid so what the big fuss?? vicki should learn to accept that reality . wait.. you’re saying it’s ok to cheat if your partner has a kid? i think that’s a little untrue.. even with a kid, no one is deserving of cheating..
oh my god… how old are these people? twelve?